Harnessing the value of unique individuals while building a world class brand. Part of the Brand Excellence series. The power of consumer product brands is well documented. Consistent delivery of a product or service—managed through rigid processes and standards—is at the very foundation of the brand promise, and is rigorously defended. Today, different types of organizations—ones that rely heavily on skilled individuals who are expected to bring a distinct perspective and capability—are recognizing the value and challenges of a focused brand strategy. From universities and colleges to professional service firms; from arts and sports entertainment to public office; the human variable is one of the last remaining truly sustainable competitive advantages. 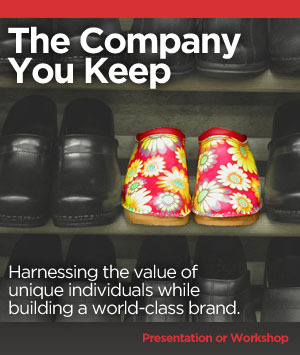 The Company You Keep explores the brand strategy challenges facing organizations that celebrate and borrow from unique individual styles. This presentation series and supporting workshops are specifically designed to help diverse and highly skilled organizations define an authentic and compelling competitive advantage. In this two part series, we’ll explore the complex relationship between individual performance expectations and a common promise. You will learn how to define and promote the culture of the organization in order to recruit, retain and nurture exceptional talent, leveraging multiple expectations and experiences into one strong brand. This presentation is a must see for senior leaders, HR teams, highly skilled individuals and the employees who support them. The Company You Keep Part 1 Building a Foundation of Excellence. > Being clear of your purpose. Define and share the non-negotiable vision, mission and values for your organization. Build an architecture of interdisciplinary brands to meet organizational goals. The Company You Keep Part 2 Engaging, Inspiring and Setting the Pace. > One future. Many paths. Discovering and nurturing leadership at every level. > Shattering expectations without changing your story. Celebrating a history of excellence while using innovation as a competitive advantage.